There is something satisfying about riding from one end of a country to another, even more so when you either start or finish (ideally both) at the sea. An end of tour saline dip is always welcome. As formalised, signed and GPXed trails continue to proliferate worldwide, some do indeed attempt such country traverses. Jordan now has the eponymously named Jordan Bike Trail, a new 700km route traversing the country from north to south. It starts close to the Sea of Galilee and finishes at Aqaba on the Red Sea. Okay, so the Sea of Galilee is actually a freshwater lake, but hey, don’t blame me. It was those New Testament authors that gave it status perhaps above its station. Jordan is squeezed between Israel, the state of Palestine, Saudi Arabia, Iraq and Syria. As far as hotspots around the globe go, this area is glowing. But somehow Jordan has managed to keep its nose clean, avoiding much of the conflict that has eaten up some of its neighbours. It is a safe and very hospitable country that offers much to visitors. That is not to say it hasn’t been affected. In a region where hard borders and countries are constructs less than a century old, history entwines the people of these nations. A measure of this is that, in recent years, Jordan has welcomed over 1 million Syrian refugees fleeing the insanities of their own government. Before I joined a 10-day tour on the Jordan Bike Trail, I had the honour of meeting some of these refugees in a Save the Children visit to Zaa’tari, a refugee camp that is home to over 80,000 people. This camp is becoming more permanent as the Syrian conflict becomes ever more entrenched. 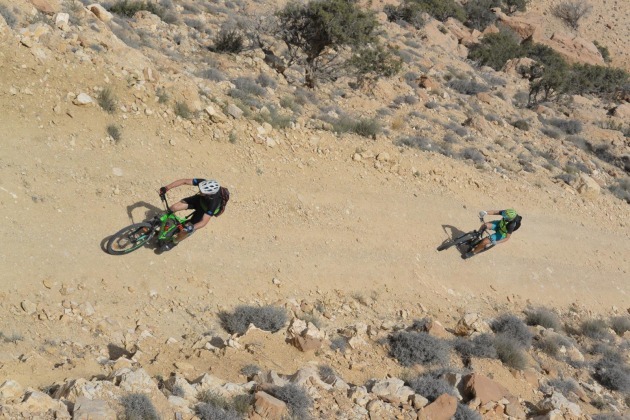 The Jordan Bike Trail is the brainchild of Matt Loveland and his crew at Experience Jordan. This youngish adventure tour company had been involved in the creation of The Jordan Trail, a long distance walking route that also traverses Jordan. Matt spent many a week riding the minor roads and mountain tracks of Jordan to pull together a route that aims to offer a great tour but also to link together some of the must-see Jordanian experiences: Dana, Petra, Wadi Rum and more. It also, in parallel with the Jordan Trail, is involved in an admirable process to develop sustainable community tourism ventures – local guides, homestay accommodation and tours. A ride down the Jordan Bike Trail is not a technical run, but a journey through a country and a culture where the mountain bike is the perfect transport on a mix of rough tracks, gravel roads, blacktop and, in Wadi Rum at least, desert sands. While a full ride down the Jordan Bike Trail takes more than two weeks, I joined Experience Jordan on a 10-day tour to cherry-pick 450km of the best of the riding and cultural experiences Jordan had on offer. We’d load bikes and bodies onto trailer and bus between riding sections. After days of wet and unseasonal cold weather, a warm sun saw us off from Um Qais, an ancient Roman city overlooking the Sea of Galilee. A haze prevented clear views into Israel and Syria, and soon washaways and gullies braked our fast descent. Flash flooding had done substantial damage to the narrow road only days before and we picked our way through the debris, pushing and carrying bikes. The new washouts claimed scalps early on. Tracey, a fellow Aussie, had a fall of biblical proportions that got the thumbs up from the rest of the group, even if she couldn’t move her own for the rest of the tour. Paolo, an Italian surfer, attempted a re-entry but somehow survived the wipe-out. "Welcome to Jordan" - it was a continuing refrain along the length of the trail and a genuine one too. Sweetened tea or cardamom-infused coffee often accompanied it. Fortunately, any day on the bike works up a usually fierce appetite and in Jordan you need it. Whether at hotel or homestay, plate after plate of food would always be laid out on low tables: hummus, baba ghanoush, falafel, dolmades, salads, breads, divine rice dishes - maglubbeh, mensaf - and much more. In the northern half of the country, the Jordan Bike Trail winds through green hills around the Jordan River Valley - the lifeblood of this water-impoverished country. On a section of rough doubletrack, we rode past a family planting vines that would ultimately provide the leaves in which to wrap delicious dolmades. The young daughter came around to each of us to offer and pour a small coffee from a flask. Shepherds waved from their perches on limestone boulders as they scanned the hillsides for rebel goats making a run for it. That same night, we dined under a full moon with panoramic views over the Jordan Valley to the lights twinkling across in Israel. As we toured around Jerash, an incredibly well-preserved Roman city, I chuckled at the grooves worn into the solid stone paved road by the passing of a thousand chariots, thinking how much softer our rubber tyres were upon the trail. But we had our own battles when, on a suitable section of dirt track, the call was made to hold the Jordanian Rolloff Championships. Who could roll furthest with no pedalling allowed? Leif, an Icelandic surely of Viking descent who had stood upon the North Pole merely a week earlier, took no prisoners and triumphed by a mile. But the prize of the day had to go to Andy, an American, who had somehow trapped his thumb in the buckle of a GoPro chest mount. You seriously could not do it if you tried a hundred times. We extricated him without loss of thumb, only loss of pride. The sand-laden Khamsin wind blew on the morning we went to Mt Nebo, our fifth day on the trail. Here, Moses supposedly saw the Promised Land but I was more interested in the historical connection to mountain biking. "Then Moses went up from the lowlands of Moab to Mt Nebo," Deuteronomy 34. We passed the Moab Land Hotel and at Mt Nebo there was a mammoth stone wheel. I looked around for Slickrock. Jordan is slashed by deep valleys – wadis – that run from east to west draining into the basin that holds the Dead Sea. The Jordan Bike Trail dives into, along and out of these as it heads south. We enjoyed a superlative day through Wadi Zarqua Main. 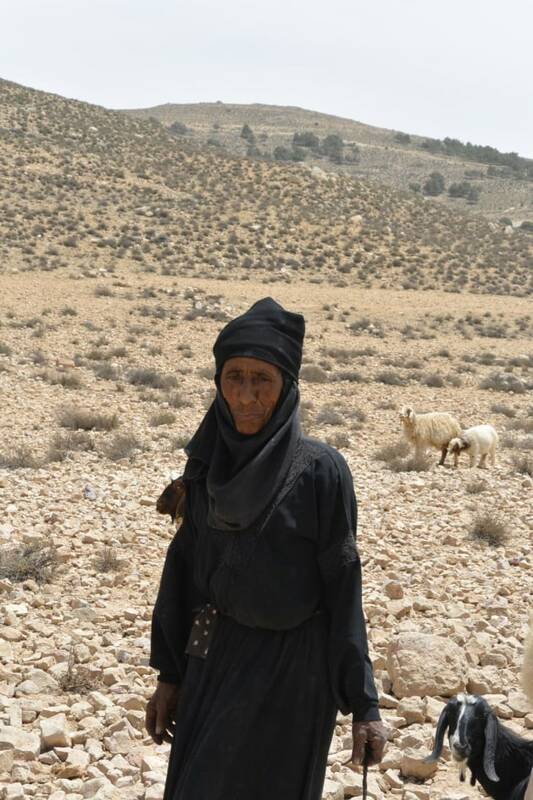 The trail passed a number of Bedouin camps; dogs and children chasing us down. At one point a horseman did likewise – iron steeds racing the real thing. On this occasion bike beat beast when the horseman lost his hat and had to pull up to retrieve it. The rocky trail cut down the wadi, crossing a few side gullies where the track had been washed away in the recent rains. Jordan is an arid land, but the rain, when it comes, unleashes much power. It was that same week when, not far away in neighbouring Israel, flash flooding claimed the lives of nine hikers. Jawad and Anton in the 4WD support that followed us (where it could) got through the first gullies with some difficulty but had to turn around eventually at a deep, boulder-strewn washout. We continued on, pink-flowered oleanders offering the only brightness in the aridness. It was late afternoon when we finally arrived at our host Abu Saif’s house for lunch; a lateness only adding to our appetite for the perfect dishes presented. With too-full stomachs we rode in the early evening light to a simple camp in the base of Wadi Hidan. Our accommodation along the trail varied greatly. We experienced homestays, hotels, comfortable Bedouin camps and this camp. All were run by local Jordanians. After a rinse in the creek, dinner was served under the stars on a breezy night. The further south we went the drier the land became. We threaded a route first to Dana, an abandoned Ottoman village perched on the edge of Wadi Al Fidan. Here, a section of technical singletrack had more off the bike than on. Katie Holden, a former US women’s downhill champion and World Cup racer, cleaned it with some ease. Petra was calling. Insanely impossible, incredible Petra. From Dana we ran along the edge of a spectacular escarpment on an undulating track with the desert far below. We rested amongst a big camel herd drinking at a trough and chatted with the young Bedouin cameleers. Eventually we dropped down toward still-hidden Petra and into a nondescript town most notable for vicious drainage grates set lengthwise down the main road, that could swallow even the fattest of tyres. In truth the modern built environment of Jordan has little to commend it; most towns and villages a haphazard collection of part-finished, blocky grey buildings. But Petra? Whole books don’t cover its magnificence, so I won’t bother to try in a paragraph. Huw would like to thank Experience Jordan, The Jordan Tourism Board and The Adventure Travel Trade Association for the tour. When to Go and How to Get There? October to May is the best time to ride the Jordan Bike Trail. The summer months are generally unpleasantly hot. Amman, the capital, is the only international airport in Jordan and can be reached from many major European capitals. Travelling directly from Australia, the quickest route would be via Gulf countries such as the Emirates who all have connecting flights to Jordan. It is possible to travel overland from Israel too. The official website www.jordanbiketrail.com is stacked with all the info you need on the trail, including downloadable GPX files. Given there is no signage on the trail itself, independent bikepackers will want these files in order to follow the twists and turns of the JBT. Experience Jordan offer tours down the JBT in full or in part. They have very knowledgeable local guides and work closely with the communities through which the trail passes. They can also provide bikes. The best source for general information on Jordan is visitjordan.com.